The finest known U.S. territorial gold coin, the 1854 Kellogg & Co. $20, graded PCGS SP-69, will return to Baltimore for a public exhibit for the first time since it was sold by The John Hopkins University as part of the legendary Garrett Collection more than a quarter century ago. "This is a homecoming. It’s the first time it will be publicly showcased in Baltimore in 28 years," said Steven L. Contursi, President of Rare Coin Wholesalers of Dana Point, California (www.RCW1.com), the coin’s owner. He is bringing it to Baltimore for an educational exhibit during the first four days of the American Numismatic Association World’s Fair of Money® in the Baltimore Convention Center, July 30 – August 3, 2008. The Honorable John Work Garrett (1872 – 1942), an American diplomat and ambassador, was the grandson of Baltimore and Ohio Railroad executive and one-time president, John Work Garrett (1820 – 1884), and the eldest son of T. Harrison Garrett (1849 – 1888), who began collecting coins as a student at Princeton. The coin collection grew extensively under T. Harrison’s sons, John and Robert (1875 – 1961). "Ambassador Garrett acquired this famous gold piece from the collection of Col. James W. Ellsworth in 1923, and it was included in the family’s fabled coin collection kept at Evergreen House mansion that was given to The Johns Hopkins University upon his death in 1942," explained Contursi. Sold by the school for $230,000 in a 1980 Bowers and Ruddy auction, it subsequently changed hands several times since then. Contursi has owned it twice; from 2002 to 2005, and since 2006. Now insured for $3 million, he has underwritten educational displays of the Gold Rush-era coin in San Francisco, Santa Clara, Long Beach and Atlanta. "It was made by a well-known San Francisco assayer, John Glover Kellogg, from gold found in the area at the time. Kellogg was a native of Onondaga County, New York and a former employee of the San Francisco U.S. Assay Office who set up his own assay company during the booming days of the California Gold Rush. He specially made this coin on February 9, 1854 and gave it to his friend and future business partner, New York City watchmaker, Augustus Humbert, the former U.S. Assayer in San Francisco," explained Contursi. Kellogg’s name prominently appears on the front of the coin on the headdress worn by the symbolic "Miss Liberty." 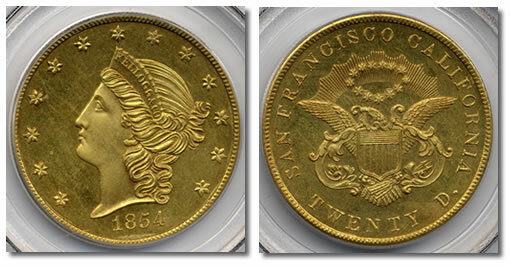 The tail’s side carries the wording, "SAN FRANCISCO CALIFORNIA TWENTY D."
"It’s the finest known U.S. territorial gold coin and the only known Kellogg $20 designated as a specimen strike. It’s in pristine condition, meticulously struck and then carefully preserved by Garrett and other collectors for 154 years," said David Hall, Founder of Professional Coin Grading Service (www.PCGS.com) and President of its parent company, Collectors Universe, Inc. (NASDAQ: CLCT). The historic gold coin will be displayed by Contursi in a specially-constructed, five-foot tall wooden exhibit case that symbolically resembles the mid-19th century cabinets that housed the United States Mint’s coin collection. The free World’s Fair of Money will be held at the Baltimore Convention Center, Hall A (Charles Street Lobby) One West Pratt St., Baltimore, Maryland. The Kellogg $20 will be displayed to the public at booth #232 Wednesday through Friday, July 30 – August 1, 2008, from 10 a.m. to 6:30 p.m., and on Saturday, August 2, from 10 a.m. until 2 p.m. The 48-room Evergreen House at 4545 N. Charles St. is now known as Evergreen Museum & Library, and operated by The Johns Hopkins University. A Gilded Age mansion, it was built in the 1850’s and purchased in 1878 by John Work Garrett, president of the B&O Railroad for his son, T. Harrison Garrett and his young family. The art-rich, multi-layered museum is open Tuesday through Friday with the first tour at 11:00 a.m. and the last at 3:00 p.m.; Saturday and Sunday with the first tour at Noon and the last at 3:00 p.m. For more information, call (410) 516-0341, or visit online at www.museums.jhu.edu. 1854 Kellogg $20 Gold at SP69 condition? Since I never heard of any coins minted in 19th Century at Mint State Condition at MS69 or Pf69 or SP69. Most coins at MS69 condition is minted recently, not long time ago! The most perfect condition for coins minted in 19th is MS66. Dumb question from a new (just starting) collector. Were there any reproductions of this coin and if so when? I have a coin in my possession that looks identical to this. I am strongly assuming it has to be a reproduction…but why and when. IM not a collector but I have a coin identical except i think its a reproduction based on the fact that right above the eagle its stamped Copy but im sure it should be of some amount of good value! Can anyone give me an answer on how much it mite be worth? I have the same question as Christopher Krezan, I have a coin identical however, it is stamped “Copy” right above the eagle. Can anyone give me an answer on how much it may be worth? I have an identical coin and the problem is that it has been placedd in a money clip. How do I go about removing the coin to reveal the back without damaging the coin? things after his passing. has anyone yet found out if there is value to this coin? Hello I have an identical coin as the 1854 San Francisco California Twenty D. Gold Coin but it has copy above the eagle on the back side. Is it worth anything, and how much can you estimate. I would appreciate any information you have about it. Thank you. I have the same coin as the others with “copy” above the eagle. Has anyone got an answer about it’s worth? I bought mine out of a magazine,”things you never knew existed”, for $14.99. The on I believe may have calue is the one in the money clip. I would have it removed by professionals under my supervision. I think you may have walked into a goldmine. Good luck. what is the coin woth with copy on it? I have a coin that has kellogg &co on the hair piece, does it have any value? Thank you. I have an 1854 coin with eagle on the back. Above eagle it has copy. It also has San Francisco California and Twenty D on back. What is the value of this coin?